Inadequate infrastructure, energy insecurity and traffic mismanagement have been identified as some of the major hurdles to achieving desired investment and economic growth in the country. 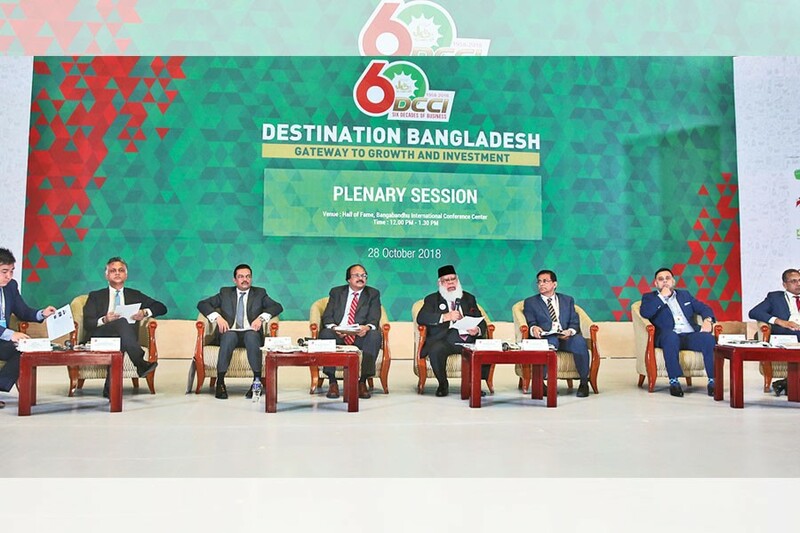 Business leaders and policymakers pointed out the barriers at the first plenary session of an international conference titled ‘Destination Bangladesh’ in the capital on Sunday, September 28, 2018. Dhaka Chamber of Commerce and Industry (DCCI) organised the conference marking the trade body’s 60th anniversary. The policymakers laid emphasis on synchronization of economic direction and skills set, and having more free trade agreements (FTAs) with other countries. They also stressed on improvement of economic governance for attracting foreign direct investment (FDI). Prime Minister’s Principal Secretary Nojibur Rahman was present as the chief guest at the session, chaired by International Chamber of Commerce, Bangladesh (ICCB) President Mahbubur Rahman. “We need to address the issues of certain infrastructure deficiency. Despite the fact that many mega projects have been undertaken, the Dhaka-Chittagong expressway which we have been talking about for a long time has not been implemented,” Mr Mahbubur Rahman told the session. Although the Dhaka-Chittagong four-lane project has been done, he said, the expressway is a must to accelerate the growth and investment. It should be done on priority basis, said Mr Rahman, also chairman of the advisory committee of the conference. He said the capacity of the Chittagong port should be doubled, but it cannot be shared with the neighbors. “At this point of time, the capacity should be doubled for our use,” he added. The eminent business leader also laid emphasis on ensuring Chittagong-Pangaon regular traffic to ease the pressure on the land. Citing an estimate of economic losses due to traffic congestion at 1.3 per cent of GDP, he noted that vehicular traffic management must be made scientific and automated. There should be no police on the street, he added. Apex Footwear Ltd Managing Director Syed Nasim Manzur said that Bangladesh is unique in mobilising resources that is domestic, but it is not enough to achieve the targeted growth. The country needs sustainable and quality FDI (foreign direct investment), he added. The FDI will not only provide capital but also transfer technology, technical know-how, skills and marketing opportunities, said Mr. Manzur. He said the government should waive the tax on skills development, reduce duty and tax, and import technology. Technology transfer is 27 per cent more expensive in Bangladesh, he added. He said that imposing duty on China by USA has created new opportunities for Bangladesh. The country should publicize its potentials in the outside world now, he added. Mr. Manzur laid emphasis on five issues-establishing skills training centers, reduction of tax and advanced tax, visa-free regime and proper management of Dhaka airport — to attract investment. General Economics Division (GED) Member of the Planning Commission Shamsul Alam said the country will have to achieve at least 9.0 per cent GDP growth and have per capita income of US$ 16,000 by 2041. But there are challenges like inadequate infrastructure, skilled human resources and energy insecurity, he said. One per cent of growth demands for 1.5 per cent of energy, he added. There is also problem with the timely execution of various projects which are very necessary, said Mr. Alam. The cost and time increases by almost 2-2.5 times not because of financial problem but due to managerial inefficiency, he added. He said that Bangladesh needs US$ 8.0 billion annually for infrastructure development, but receives only US$ 2.5 billion. The present mega projects would not be enough to achieve the 9.0 per cent growth, he added. He laid emphasis on strong regional cooperation, trade liberalization and more FTAs with other countries. Vietnam has FTAs with 20 countries, he added. He stressed the need for a deep sea port which should also be allowed for using by the seven-sister states of India. In his keynote presentation, Chief Executive Officer (CEO) of Standard Chartered Malaysia Abrar A Anwar said that in recent years, seven out of the top 10 valuable companies in the world are technology based. The number was only two 10 years back, he added. “Bangladesh cannot reach the higher growth trajectory automatically. It will happen if we can ensure a well synchronised management of the key sectors of economic development on a sustainable basis, deploy the appropriate skilled human resource base of the country and utilize technology and productive resources,” he said. As much as US$ 320 billion investment will be needed by 2030 in infrastructure, he added. Mr Nojibur Rahman said the government considered private sector as the growth engine for which it has been facilitating the business and investment opportunities. The public private partnership (PPP) initiative is an example of the successful partnership between the private sector and government, he added. He emphasized on mega project based investment in future.